Mimsy: Why do gun owners think the left wants to take our guns? For years, the NRA has been trying to pass laws to make the background check system more reliable. For years, Democrats have opposed these laws, even filibustering them, to keep them from passing. The current version of the Cruz/Grassley bill to reform background checks is H.R. 38. It has passed the House and only needs to pass the Senate. It does literally what you are claiming we should support: improves background checks and increases law enforcement’s resources to enforce background check laws, in ways that would have stopped previous mass murders. At the same time that it cracks down on criminals it makes life easier for law-abiding gun owners by removing the pointless hassles we all have to got though every week but that criminals ignore. If the left really believed what you wrote, H.R. 38 would have sailed through Congress. And yet it passed the House with 225 Republicans in favor and 184 Democrats voting against. It appears that the left doesn’t agree with you. Write your Senators, both Democrats, and convince them to vote in favor of H.R. 38 in the Senate. I will believe it when I see it. She replied with a naked link to a Washington Post article, “Why Senate Democrats are considering holding up a gun-control bill from one of their own”. I read the article—and I’m guessing she either didn’t, or she was so caught up in the eye of the insulter that she didn’t realize it contradicted her original plea for common-sense reforms. Democrats, according to the article, had said they just wanted to reform background checks, not ban guns. Republicans joined them.1 Now Democrats were saying they really wanted more restrictions. Okay… I can’t say I disagree with them wanting more restrictions. This is why gun owners always believe you want to ban firearms when you use weasel phrases like “common-sense gun laws”. Because you are so quick to refuse good reforms that you said you wanted when they don’t actually restrict firearms ownership. It happens in conversation, with individuals on the left berating gun owners for hearing the wrong thing, and then saying what they berate us for hearing. We want common-sense laws to stop violence. Stop thinking we want to take your guns, why can’t we reform the background check system? Great! Here are some common-sense laws to reform the background check system. They’d actually have stopped these murders. I can’t support that. It doesn’t ban any guns. And it happens nationally, with Democrats saying they want reform and blocking it every time it comes up. It doesn’t help when they try to redefine confiscation to not include confiscation, so that they can say they’re not trying to confiscate firearms as they confiscate firearms. Monday night, Rep. Swalwell [D-CA] appeared on Tucker Carlson’s show where he was asked to defend his proposal. Swalwell immediately claimed his proposal wasn’t calling for “confiscation.” “I’ve never suggested sending troops out or collecting, confiscating,” Swalwell explained. 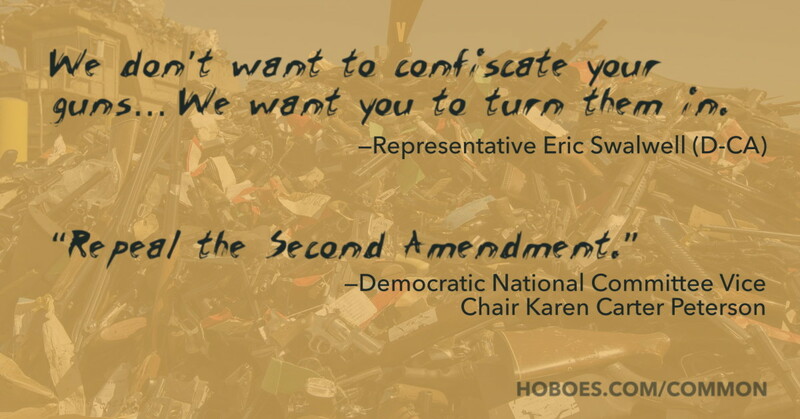 And when one of the vice chairs of the Democratic National Committee writes “Repeal the Second Amendment”, it’s hard to take that as anything other than wanting to get rid of the second-biggest impediment to banning guns. The Second Amendment doesn’t impede background checks, after all. The NRA as a membership organization frightens and confuses the left. They have to pretend that it’s not a membership organization, and so they have to dehumanize its members. All of the complaints about “the NRA” and “the NRA’s influence” are precisely to obscure the fact that the National Rifle Association follows its members. Its leaders are elected by the membership. Its funds come from the membership. You can see this by looking at their financial statements. In order to get around this, the left needs to create wild conspiracy theories. While trying to determine where a photo of a pile of what looked like very nice firearms about to be destroyed came from (it came from Los Angeles), I did a Google image search. “Best guess for this image: Democratic Party”. For example, How the Gun industry funnels tens of millions of dollars to the NRA. It goes to ridiculous lengths to paper over the fact that gun owners are more likely to buy guns from companies that are friendly to the NRA than they are to buy guns from companies that are not friendly to the NRA or who actively oppose it. From Ruger’s $1 donation for every gun sold to the NRA Round-Up that offers customers the option of rounding their purchase up to the nearest dollar to benefit the NRA, these programs are all aimed at individual gun owners, not the NRA. Both are added to the price of the purchase and paid, willingly, by the individual purchaser. In the case of the Round-Up program, it’s even a voluntary checkbox. The big takeaway from that article ought to be that the NRA used to be a giant social club, and now is a lobbying powerhouse. The writer puts that at the beginning, and then makes no attempt to address the elephant in the room: why did the NRA change? It’s a lot easier to be a social club than a lobbying group. You can get a lot more big donations from the big funding organizations. The reason the NRA changed is that, in the sixties and seventies, the left was literally trying to ban personal self-defense by banning all firearms through organizations like the National Coalition to Ban Handguns. The National Coalition to Ban Handguns changed their name in 1990 to the Coalition to Stop Gun Violence without changing one bit of their policies. So when you talk about stopping gun violence and gun owners hear “we want to take away your guns”, that is one reason why. You’re using a long-established buzzword for “we want to take away your guns”. There is no social club for an item that doesn’t exist. That’s why the NRA shifted—but not because the leadership wanted the change. The NRA shifted their policy because their members demanded it. The NRA leadership wanted to continue getting money from organizations like the Ford Foundation. The members wanted to protect their second amendment rights. Because the NRA is a membership organization, the members won. They voted the old leadership out and a new leadership in. When the left says that the NRA is evil, gun owners reasonably hear that as saying all gun owners are evil. The NRA is the member, and every member knows it. Every member knows why self-defense rights have improved since the NRA changed course. We don’t have an Australian ban, or a British ban. We have 42 states that don’t restrict concealed carry, and a falling violent crime rate. Serious progress can only be made when gun owners stop conflating 2nd amendment rights with the NRA. Getting the NRA out of the discussion is the biggest impediment to making any progress. What progress is the NRA blocking? They support background checks. They support red flag laws. They even support banning bump stocks. That’s pretty much how it always goes. I’m the NRA. I’m a member. You shouldn’t be. The NRA is a puppet of big money. No, the NRA wanted to be a puppet of big money, but we voted the big-money leadership out. Conspiracy. Corporations. It’s the corporations, and the conspiracy of corporations, to corporately conspire. I don’t want to ban guns, I just want to sideline the NRA, so we can have a real discussion on what to do about guns. My NRA is the only thing keeping you from banning guns. That’s why you want to get rid of it. The only thing the NRA is an impediment to is actual gun bans. That’s why we know what you really mean when you say you just want common-sense gun laws. We support common-sense gun laws. The NRA supports common-sense gun laws. The only reason you could have for wanting to get rid of our most effective organization is because you want to confiscate our firearms. No matter how you try to redefine confiscation. In response to Institutional memory in political campaigns: Every four years, some conservatives buckle under the press’s lies, and hope that groveling will make the press treat them nice. It never works. Note that this is misleading on the part of the Washington Post: Republican Ted Cruz has been at the forefront of background check reform for years, only to have the reform blocked by Democrats. One of the many reasons Democrats lost the 2016 presidential elections is that their party’s rules has a mechanism for ignoring their membership, and the Republican Party does not. 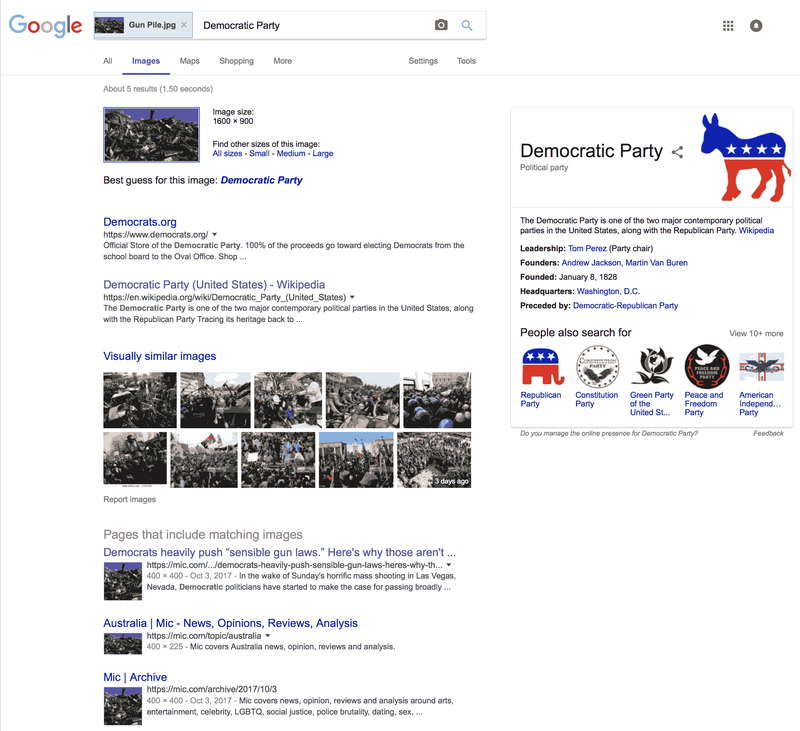 The Democrats’ party leadership tried to push their candidate from the top down, whereas the Republican candidate was purely a grassroots repudiation of the party leadership. Look, for example, at the AARP for an example of the way a leftist organization acts: Setting policy from the top down, regardless of how divided their membership is on an issue. It’s up to the members to set policy for the NRA; it is up to the AARP to set policy for their members. It’s a completely different view of how organizations should act. If you want a conspiracy, consider explaining the CDC’s attempt to hide research that replicated other research showing benefits to private self-defense. This had to involve a lot of people making a lot of decisions about what not to talk about and how to keep it hidden. Effective politics means supporting candidates who share your principles, not who share your party. If your support reflexively goes to a single party all the time, that party won’t care about your principles. The National Rifle Association knows how to ensure that their members make a difference when they vote. Why do gun owners think the left wants to take our guns? last modified July 28th, 2018.